When you're up in a tree, your life literally depends on your climbing line- which is why we only sell lines from companies we trust: Samson, Teufelberger, Yale, Sterling, Petzl, Marlow, and Edelrid. The arborist climbing lines you see below all meet the ANSI safety standards for arboriculture. Never use a rope for climbing that has been used for rigging! Arborist climbing lines by brand. We only carry ropes you can trust. 11mm, kernmantle access line from Petzl. 12mm, 16-strand Samson rope available in 4 colors. 12mm, 12-strand, durable & affordable climbing line from Samson. 11mm, 24-strand, lightweight double-braid climbing line. 11.7mm, 24-strand double-braid from Yale that runs well in hardware. 12mm, 12-strand, very pliable 1/2” line form Yale with excellent visibility. 13mm, 24-strand by Edelrid is strong, light, and easy to handle. 11mm, Kernmantle from Teufelberger ideal for use in hardware. 13mm, 16-strand all-polyester Marlow climbing rope. 10mm & 11mm Sterling Kernmantle is high-strength and low-stretch. 12mm, 24-strand Yale line designed to be easy to grip & ergonomic. 11mm, kernmantle Teufelberger line is an excellent static access line. 11mm, kernmantle from Yale performs well in all systems. 11mm kernamntle from Samson with firm body. 10.5mm, kernmantle access line from Petzl. 10.5mm, kernmantle Teufelberger line. Premium rope for SRT climbing. 11.4mm, 24-strand Samson climb line in the best camo pattern available. 11mm, kernmantle Edelrid line is light, strong, and handles great. 12mm, 16-strand rope by Teufelberger with built-in safety core. 11.5, 24-strand Sterling line works well in all climbing systems. 11.8mm, 48-strand Yale climb line is built for new climbing methods. 4 diameters, kernmantle Samson line for access, rappelling, and rescue. 11mm, 24-strand Teufelberger climbing line available in 3 colors. 11.1mm, 24-strand Tendril climbing line available in 2 colors. 12mm, 12-strand Samson rope is supple, strong, and durable. 11.7mm, 24-strand Marlow line built for MRS or SRS performance. 11mm, 24-strand Samson line is very light, premium, V-series rope. 11.8mm, 24-strand Marlow built for the newest climbing tools. 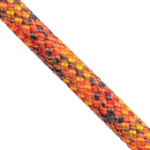 12.7mm, 24-strand Samson V-series rope is light, strong, but full-bodied. 11.8mm, 24-strand Samson V-series rope built for new climbing gear. 11mm, kernmantle by Sterling with Nylon core. 12.5mm, kernmantle by Sterling with Nylon core. 11.7mm, kernmantle by Teufelberger with Nylon core. 12mm, 16-strand Yale line stays round and firm under load. Professional rope splicing service available through WesSpur.